It is a simple design that could be put together rather quickly and could easily be duplicated. Sadly, I'm in need of three separate Sympathy cards at the moment, so I will likely use this design again. Die Cut the Jocelyn Die 3 times out of Vellum and 3 times out of White Cardstock. Layer, adhere and arrange the cuts across the front of a 6x6 card as shown. 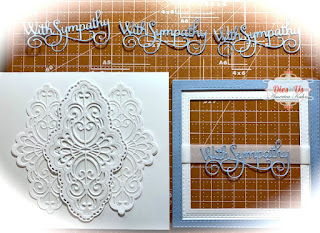 Then Die-Cut frames out of both White and Blue Cardstock. I also cut-out and extra framing out of white recycled cardboard (from 12x12 packaging sets), and adhere to back of layered frames for added dimension. Trim a strip of Vellum to adhere across the white frame then place blue frame over this to cover edges. Your sentiment will then be added over the vellum to separte it from the background. 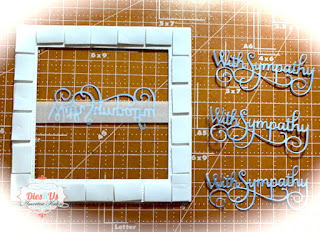 For extra dimension to the framing, add foam adhesive to the backing of edges as shown. Then layer and adhere the 3 additional die-cut sentiments and place over the vellum strip. Adhere entire framing over the background. Finally add your bow and Pearls. That's it! ARE YOU a Sue Wilson FAN?Then hurry on over to check us out at this awesome Facebook group of FANS! We love to create, inspire, interact, share ideas, tips, tricks and tutorials of fabulous makes using Sue Wilson's products! Click HERE to get there and come join the great FUN! "Sue Wilson Fans in the USA and around the Globe"
Amazing card, America. Great inspiration and I love your photo tutorial. Hugs, my friend. Oh, this is absolutely stunning! Sympathy cards are the most difficult to make, in my opinion. I am sure this beautiful card will bring comfort to the family. Thank you for playing with us at Make My Monday and hope you can join us again soon. Sympathy cards are notoriously difficult to design, but this is beautiful. It is elegant and understated. 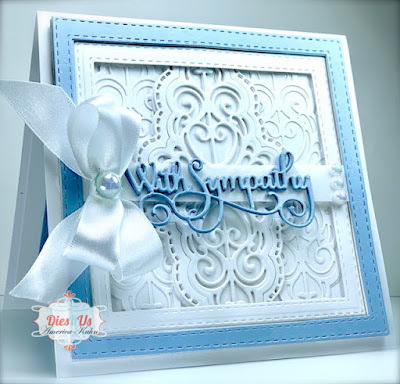 I love the way you layered the stitched die frames and added the sentiment. Just a gorgeous design! 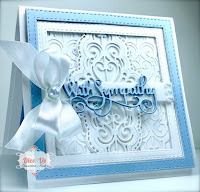 Thank you for sharing your project with us at the Crafts Galore Encore “Anything Goes” March Challenge. Good Luck and hope to see you again next month! Very beautiful and elegant, America! Beautiful creation, lovely design! Thank you for sharing with us over at World Wide Open Design Team Challenge and best of luck with your entry. This is so elegant just beautiful Thank you for sharing in our challenge at Classic Design Team Challenge we really appreciate you joining in. What a lovely card, the blue is a perfect color. So glad you joined us for the March challenge of "Anything Goes". Very cute card. Love the color combination.